Microsoft has introduced a new service called "Microsoft Your Account" through which Microsoft's user can get all of their online data information under one spot. Microsoft is currently providing several different businesses and services and many of those divisions have their own account features for different users, Services like Zune, Xbox 360 and Windows Phone offers downloadable software and content for sale on other side Hotmail and Microsoft Office have their own paid options. Now Microsoft has launched a new website service known as Microsoft Your Account, which brings all of those payment options and procedures under one spot. 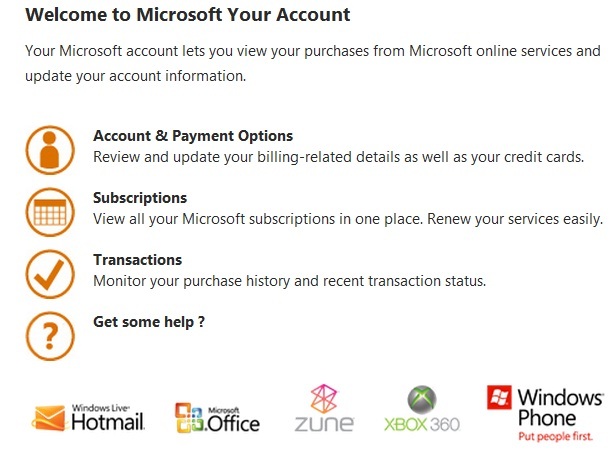 According to Microsoft's Within Windows blog, Microsoft Your Account will allow users to see the purchase history for their various products and services. For example it will let you see if you have bought an Xbox Live Gold subscription. You can also update your accounts with new details or make changes such as deleting an expired credit card number. As we know Microsoft is soon going to launch Windows 8 OS and will offers Windows 8 Metro Apps via the Microsoft Store under Microsoft Your Account service. This new account page would seem to confirm that Microsoft is moving toward having users of all Microsoft products be under one unified payment system. 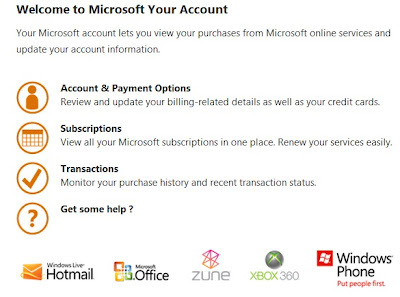 You can get more details on Microsoft Your Account by clicking here.